This 60 Hatteras is built with CAT C32's @ 1650 BHP, twin 21.5 kw generators, full tower and a cherry satin interior. In addition, this boat features the four stateroom, three head arrangement. 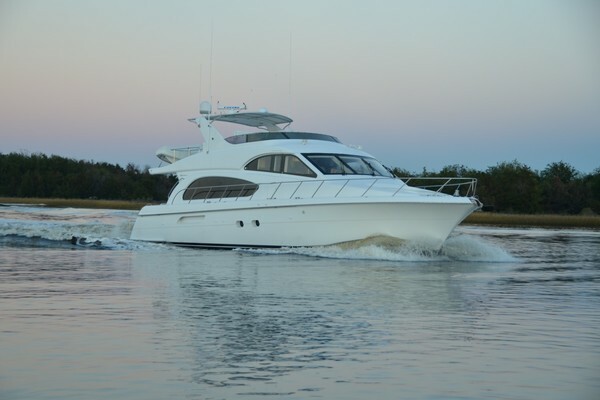 United Yacht Sales New Jersey would love to guide you through a personal showing of this 60' Hatteras 60 2010. 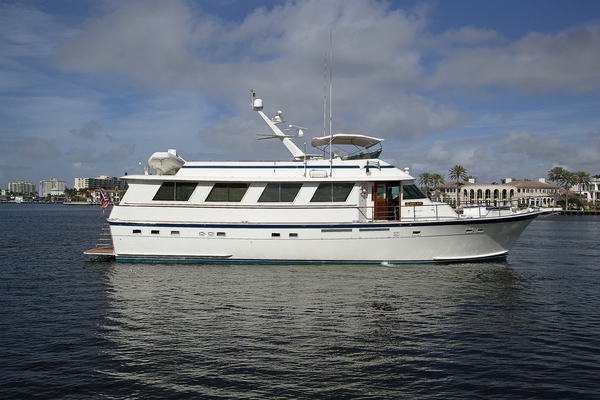 This yacht for sale is located in MIAMI, Florida and priced at $1,799,000. For a showing please contact us by filling out the form on this page and we will get back to you shortly! Exterior Finish and ConstructionThis boat is a perfect blend of speed and style with focus towards fishability. The Hatteras 60 hull is resin-infused producing a more uniform hull thickness and providing an ideal resin to glass ratio. It is also one of the few boats today that provides a rich coat of protective polyurethane paint producing a hard outer surface that provides protection from those gel-coated porous surfaces found within other brands. - Isophthalic gelcoat, exterior layer- Blister-resistant vinylester resin in hull bottom skin coat - Hull and superstructure linear polyester/polyurethane coating - Polymer/copper-based anti-fouling bottom paint Boot stripe, linear polyester/polyurethane coating - Decks, non-skid surface, polyurethane paint with polymeric beads - Solid fiberglass, resin-infused hull bottom - Hull sides and superstructure resin-infused with PVC foam core - Resin infused fiberglass stringers - Steel laminated in stringers at key locations to bolt engine mounts - Engine room bulkheads and decks resin-infused composite construction using PVC foam core with layers of fiberglass laminate on each side. The Hatteras 60 Convertible features a mezzanine cockpit, lightweight construction, tumblehome curvature in the hullsides and an exciting tournament edition option. This model also features tumblehome in the hullsides and a completely resin-infused hull, rather than one built up of layers of hand-laid fiberglass. The automated resin-infusion process produces a more uniform hull thickness from one hull to the next, as well as the most ideal glass-to-resin ratio. This one-two punch produces a boat that weighs significantly less because of the lowered resin content, while providing a more precise fit of bulkheads, stringers and other components for increased strength and durability. For the hard-core fishermen, the Hatteras 60 is also be available in a 60GT Tournament Edition. This three-stateroom two-head package includes an engine upgrade to 1,800 hp, custom hull color and a wraparound windshield styling element. The 60 Convertible features a luxurious salon with a comfortable L-shaped sofa with rod storage beneath, as well as an entertainment center with 42-inch plasma TV. Genuine wood veneers in either a high-gloss or satin finish provide a warm environment, complemented perfectly by any of the 15 standard décor schemes available from Hatteras' in-house design team. To provide convenience for the crew, the electrical distribution panel is located just inside the sliding door, easily accessed from the cockpit. The galley features two under-counter Sub-Zero refrigerator/freezer units, with a third unit available as an option. A four-burner ceramic cooktop and microwave/convection oven provide plenty of food preparation options, while deep storage drawers in the galley's fascia offer an abundance of space. Amtico strip flooring and solid-surface countertops and backsplashes give the galley an elegant look with long-lasting durability. To starboard, a large dinette features an L-shaped lounge with storage underneath. The dining table features a solid-surface top with decorative pedestal. Belowdecks, the 60 is configured with three staterooms and two private heads, providing for ample storage for the rugged sportfishing enthusiast. Overnight tournament fishermen will appreciate the optional bow stateroom that utilizes crisscrossing bunks to maximize sleeping capacity in this 3/2 arrangement. Those who value added interior amenities can opt for a more traditional three-stateroom three-head arrangement. A four-stateroom layout is also available.